The House Republicans’ strategy with respect to the current fiscal impasse has been wrong-headed from the beginning, in my view. Refusing to pass a continuing resolution unless Obamacare was delayed for a year resulted, predictably, in a partial government shutdown with no end in sight. On the other hand, John Boehner and the House Republicans did not, initially, try to use the debt limit–a much stronger issue–to get concessions from the Democrats. But as the days have gone by and the debt has approached closer to the limit, the two issues have been linked. Now, however, the House leadership is calling for a six-week increase in the debt limit, with no strings attached–i.e., Republicans get nothing in the form of spending cuts–while the shutdown drags on. This represents, I think, the worst of both worlds. Conservatives have been critical of the Obama administration’s handling of the shutdown, but the Democrats are basically correct in thinking that they are winning the PR battle. Most people either don’t know about the WWII memorial, Mount Rushmore, etc., or else don’t care. 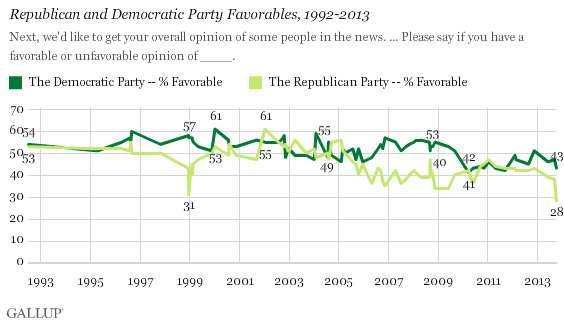 This doesn’t mean that the GOP’s position with the public is hopeless. On the contrary, voters generally side with Republicans on the ultimate issue: they want federal spending reduced. In this Rasmussen survey, for example, 53% of voters say they want “significant spending cuts” in any deal that raises the debt ceiling. That is what Republicans should be using the debt ceiling trying to achieve, as they did in 2011. Instead, Republican leaders–apparently stampeded by the Democrats’ entirely false threats of default, or stock market collapse–are throwing away, at least for now, the issue on which they have strong bargaining power–the debt ceiling–and instead are continuing the shutdown battle, where there is no viable end-game and in which Republicans are getting slaughtered, politically. In my view, this is an unfortunate strategy, to say the least.